Hi Matt, I have also reviewed the best way to take notes. The information is vast, the sources from multiple sources and formats. I started with my note book, pen and started to note down from the various lessons, live sessions and text books. Now i have gone down the texhnology route, I am using my iPad, this is proving to be extremely useful for a number of reasons. The use of software – for example SimpleMind+ is a free app that rivals iMindMap pro and is completely free. I have been summarising the key terms – threads into mind map format and then pasting them into presentation format. I have also been putting my notes into slide format in the Keynote (Apples PowerPoint Equivalent) chunking the data into easy to manage slides. Note taking electronically has both positive and negative aspects, initially can be time consuming, however you have the ability to cut and paste from the lessons, add in links, print off hard copies, quickly edit…… The list goes on! Not sure if this is going to work out for me, however so far so good. The information seems to be sinking in a bit easier once I have put it into a presentation format. See you at the Warwick week. Thanks for sharing your comments Leon – I like the idea of using a presentation format, and might try this out myself. I’ve also tried using my iPad, but found I couldn’t type as fast on the soft-keyboard so reverted back to using my Mac. I might have another attempt though, as it will be far more convenient for Warwick Week. Ian Thomas – Executive MBA graduated 2005. For me, I asked myself ‘in reality, what was the likelihood of me fully reading my notes in the future? Based on the above, I would write all over my text books with examples, notes, and my own experience laid over the top of academic notes and principles. This way, I learnt how to analyze and interpret my own experience, and use the MBA framework to understand the situation better rather than just learn how to pass an exam. To this day, whenever I get any text, tender, educations, course material etc etc, I just go to work on it and mind dump everything that I think is relevant, real world, conceptual etc and take it from there. I also don’t have a problem scribbling over books or notes I have made as lets face it, when you buy a toolkit, just because one has 150 tools in a box it does not mean one has to use them all, one ends up using 10 key tools and that should be the same learning and application outcome from an MBA. Hi Ian, thanks for sharing your post-MBA views, its good to know what works for someone who’s graduated. So as I do not start the MBA until this July I cannot speak to how it will be. but for my MEd which had some online I constantly found like Ian that I would very rarely ever return to read my notes. I believe notes can be very helpful by getting us to mentally go over that knowledge again and from a slightly different angle. What I found most useful was to go a little bit overboard in the class discussions on “why this, or why not this”. By that I was getting the rewriting of the material and concepts but I’d also get the interaction and points of views from fellow students. Prezi may be presentation software you find very useful. Matt and Leon question for you on literally time per week, 10 hours, 30 hours? Reading, writing, and debating with fellow students. Hi Lee, thanks for sharing your views. I’m studying for the distance-learning MBA, and the recommended study time is (I believe) 12-15 hours per week. I think this is probably the minimum that can be spent on the course, and this is just if you want to cover the content and complete the exercises. Getting involved in the discussions and reading complementary material (eg. other books or news articles) could very easily add 3-4 hours every week, so I would personally try and target 18-20 hours if you have the time. I was not aware of Mindmaps until reading your article, so I’m not sure how effective they would be for me when taking notes. I tend to write notes out by hand though, because I find that I am more likely to retain that information (even if I don’t ever go back and review the notes). This method worked for me all through college and is working now in my MBA program as well. I’m curious to see if my strategies will still work the further I get into my program. Hi Matt, great post. I use mindmaps all the time as my preferred way of taking notes. What program have you used above? I started using Freemind (open source and free), but it was a bit buggy so I researched and discovered the project had split off into a program called Freeplane (also open source and free) which seems to be better maintained. The interface is pretty much identical to Freemind but it just holds together a lot easier for me. Plus it has the ability to save to XML format, which means I can use my mindmap notes to create a small website when I’m finished and browse my notes in a web browser. I also think the best thing about using mindmaps is the non-linear approach you can take to remembering things. Really really useful tools for any online degrees or other distance learning courses. Sometimes I just download all the learning material and stick it on my aging Sony bookreader too. That way, I can carry it around with me and read maybe half a page when I’m not doing anything serious. It makes revising notes far less stressful. Hi Emma, thanks for the comments. 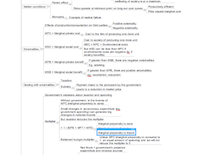 I use Mindjet’s MindManager for my notes, but have also used MindMeister in the past. Hi Matt – Please can you comment on what you do with MindManager. I am in my first semester and feeling overwhelmed by all the work and wondering if I’ll ever recall it. So far I have been using the Structured Not Taking technique that you shared with me and I’m finding it useful. I am doing it in Excel but might switch it to Evernote provided it allows me to use columns. Also any ideas on the best way to capture notes for the EBE module are appreciated. I am finding the module to be quite challenging to capture notes for without rewriting everything that is already in the material. How is the MAM module so far? I have heard it gets to be rather challenging – although I think more like the MAM material than I do the EBE material. For OB … towards the end of the module I had mainly moved away from mindmaps for note-taking, as I found the structured approach using Evernote worked far better for me. That’s not to say there’s anything wrong with mindmaps, its a lot down to personal preference and what how you plan to use them – for example, I still used mindmaps to develop my final assignments, as they were great for brainstorming ideas and then moving them into a structure that flows. For EBE and AFM … I stayed with mindmaps all the way to the end, as they seemed to fit the content better (more concepts than theories). I too started rewriting all the content in my notes, but after a couple of lessons realised that the best thing to do was just include the topics in the mindmap. I then used these when writing the assignments to remind me of topics so I could determine their relevance – if they were relevant I would then refer back to the original textbook. I’ve not really got into MAM yet so can’t comment on that one, but as I have a more mathematical background, I think MAM will probably be easier to understand than EBE. If it helps … I found the first few weeks quite challenging as I got into the routine, but it got easier as I moved into month 2 and onwards. The important thing to remember when writing notes is not that you’ll need them to recall facts (as you have access to the textbooks) – instead you need them to remind you of the concepts so that you can determine the best theories/concepts, etc. to use. 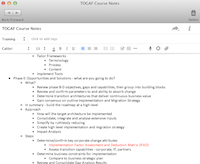 I’m just starting semester 2 and was wondering if you have any recommendations on the approach to taking notes vs. the approach in semester 1. For semester 1, I mainly highlighted and made notes in the margins of printed unit notes. Because of the exams in semester 2, I will have to change my approach. I’m thinking of making summary notes for each unit in addition to highlighting and writing in the margins. I realize that it will take more time, but with final exams vs. end of unit papers, my time will be spent differently towards the end of each module (ie- no need for huge chunks of time to research and write papers — I will need the huge chunks of time to revise!). Any tips (time permitting) would be greatly appreciated. I also took a different approach given that these modules are assessed by exams. The summary notes are a good idea (this is what I did), although I went into too much detail in mine which wasn’t useful whilst revising, so watch out for that. One point I would mention is that the OM and Marketing exams require you to talk about the different aspects of a topic (eg. Lean operations) – I stumbled on some questions because I couldn’t recall all the different options in the list (although I could have easily talked about them had I remembered all 3 options instead of 4). So I’d suggest focusing some time on capturing the key lists so you can revise these thoroughly. As for MAM, I hardly used my notes in the exam – despite it being open-book. Instead I just referred to the books themselves. I personally wouldn’t spend too much time on note-taking – this time would be better spent doing the practice exercises (in my opinion – although I found the actual concepts straightforward, so if this is not the case you might want to write more notes). This is very helpful. Thank you very much! I will take the summary approach, and will see how much of MAM is familiar and determine level of detail accordingly. I appreciate your insights on this as always.